Think of the most versatile centers in the NHL, and certain names inevitably come to mind -- Pavel Datsyuk of the Detroit Red Wings, Mike Modano of the Dallas Stars and Mike Richards of the Philadelphia Flyers. Somewhat unnoticed has been the emergence of Mikko Koivu as one of the premier two-way centers in the game. Ignored by many, the Minnesota Wild understand just how important the 25-year-old Koivu is to their team's success. So important, in fact, Minnesota made Koivu its team captain for October. Furthermore, Koivu will permanently share the captaincy with 12-year veteran Andrew Brunette for the balance of the season. "Mikko Koivu has raised from his big brother`s shadow..."
"Where would we be without our Finns..."
"We're very proud to have Mikko and Andrew as the two alternate captains," said Minnesota coach Jacques Lemaire. "Both of them are good leaders. There are a lot of good leaders on our team this year. We have more (leaders) than we ever did and even though we picked (Koivu and Brunette) it took four hours of meetings. That's how important it was for us." The decision to raise Koivu's responsibility comes as no surprise to the players who have to compete against him. To explain the early season success of the Montreal Canadiens and Minnesota Wild, you don't have to go too far from the house of Jukka and Tuire Koivu in Turku, Finland. Being the sons of hard-working parents -- a hockey coach and nurse -- Saku and Mikko clearly understood you have to work hard to achieve your dream. Now, both are leading their teams -- becoming the first brothers to be captains of their respective clubs since Brian (St. Louis) and Darryl Sutter (Chicago) from 1982 to '87. Though he is 4 inches taller and better than 25 pounds heavier, Mikko has almost always found himself in his brother's shadow -- not surprising when you consider that Saku Koivu ranks right up there with Jari Kurri and Teemu Selanne as the greatest players in the history of Finland. "Saku is 8 1/2 years older. I remember when he was drafted in the first round (No. 21 in 1993) I was 10. He left home when I was 11 and I won't lie, it was tough trying to live up to him because he was the most popular athlete in your whole country as a kid," Mikko said a while back. "Kids at school ... everybody ... wants you to be your brother. "Now that I was also a first-round pick (No. 6 in 2001) and have been in the NHL for a while, I kind of look at it like I've established my own identity and it's kind of my time to play the game." Mikko came into his own last season, his third in the NHL, especially in the playoffs when he had 4 goals in just 6 games. He became a go-to guy offensively and captain and leader this season after the departure of veteran forwards Brian Rolston and Pavol Demitra. Previously he was a defensive role player, a byproduct of the tutelage of his dad, who was a defenseman and later coached at the Finnish Elite League level for TPS Turku. Being well-rounded at both ends of the rink was first and foremost on the minds of both Koivus. Saku's play is punctuated by speed and shiftiness. Mikko, who is bigger and more physical, is fast becoming one of the 5 or 6 best young players in the game with his size, speed and grittinesss. Playing fast, responsible and productive. That's obviously the Koivu way. 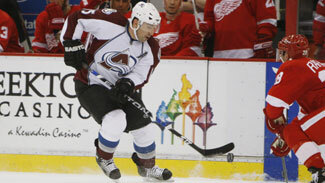 "I think he is a really good player," Detroit Red Wings forward Dan Cleary said. "I thought he was great last year. I'm not surprised at all. Koivu is a great two-way player, very strong in the faceoff circle and can play in any situation. I think it was a good decision making him their captain." Of course there have always been NHL players like Koivu -- unsung heroes who do not always capture the limelight, but find redemption in a job well done. They are typically team-oriented players who combine stalwart defensive play with timely offense. Yet, by virtue of geography, personal style or the existence of dominant teammates, they don't receive full credit for their outstanding play. Sometimes you don't notice them until they're gone. "Koivu is a good two-way player and is very dangerous on penalty shots," said Detroit goaltender Chris Osgood of the Wild captain, who tied for first in the League with 8 shootout goals in 2006-07. "I noticed that he missed some games with an injury last year and he is one of those guys that you don't notice how good he is until he is actually not playing for his team. When he is playing you tend to take him for granted. He reminds me of Samuel Pahlsson of Anaheim but (he is) better. Koivu is a real good two-way guy, but when he wasn't playing you realize how much they missed him." Minnesota's first-round pick (No. 6) in the 2001 Entry Draft, Koivu packed on pounds of muscle during the past summer in anticipation of a break-out season that places him as Minnesota's top-line center and a leader on special teams. He led Wild forwards in time on ice (20:54) in 2007-08, and notched 42 points in 57 games while ranking second on the team with a plus-13 rating. "It is a big honor to be among the groups of captains on an NHL team," Koivu said. "The guys who wore the 'A' before were the guys that I looked up to and that even makes the captaincy bigger for me. It is a big moment in my career. "As for my game, I try to do it both offensively and defensively. You have to play solid defense first. Then when you have a chance to score of course you want to score. You get a good feeling when you play good defense and after that you will have some chances to score goals. But overall for me, it's more about being happy when we get wins. I want to be known as a solid two-way player and a team guy." The 6-foot-2, 216-pound native of Turku, Finland, has collected 117 points in 203 career NHL games and will likely eclipse all of his personal bests if he stays healthy during the current season. But statistics tell only part of the story. There's a fire inside this soft-spoken Finn that burns as intensely as that in any competitor. "Mikko is a real competitive guy, and it's great that he is their captain," Ottawa Senators forward and fellow countryman Jarkko Ruutu said. "He has put a lot of work into his hockey. I played with him on the national team a few times and he played a lot with my brother Tuomo (of the Carolina Hurricanes). They were a duo growing up. Mikko is a good player and is very competitive. When you play against Mikko you quickly realize that he is real competitive and that's what I respect about him the most, he is a real competitive guy. It's a great accomplishment to be a captain for an NHL team and Mikko will do well as a leader for that team. "It hasn't been that long because 15 or 20 years ago there weren't many Finnish guys that played in the NHL and now you have two brothers from Finland as captains of their (respective) teams." Ruutu is referring to Mikko and his brother, Saku of the Montreal Canadiens. Both brothers were nurtured under the TPS Turku system in Finland and inspired by the example of a handful of Finnish players who crossed the ocean and made an impact in the best hockey league in the world. "I didn't model my style after one player, but I admired all of the big names from Finland," Koivu said. "Jari Kurri and Teemu Selanne were big names while I was growing up in Finland. I used to watch how they did everything. Now I have the opportunity to see some of those guys on the national team and try to learn. It's good that a small country like Finland can have such great players like that and now have Teppo Numminen playing the most games as a European player. That is something that may be hard for North Americans to understand, but for a small country it is very significant for us. It's really good incentive for our younger players." Saku had an influence on his younger brother too. "A big one," Koivu said of his older brother. "For everybody who has an older brother or a father who played in this League it is a special feeling. I appreciate what he has done for me and I hope some day I will be able to give it back to him." There are different ways for Koivu to give it back to his brother -- in gratitude or by his example on the ice. If the two brothers meet in the Stanley Cup Playoffs, the Minnesota Wild faithful will want their captain to give it all back to his brother... in spades.